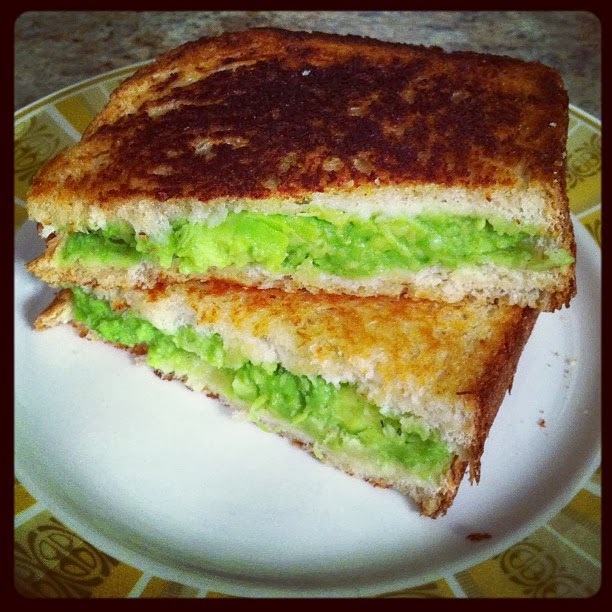 Flour Mayhem: Avocado Grilled "Cheese"
Let me tell you something friends, I kind of love avocado, I mean who doesn't? I eat it everyday, I can eat it for every meal, put it in smoothies, the list goes on and on. One night Jason wanted me to make grilled cheese with my caramelized onion french soup. Well, I made that for him, but for myself, I made the most amazing sandwich EVER! It's so easy too. You make it just as you would a normal grilled cheese, just stuff with mashed avocado and toast in a skillet. Simply amazing folks. Go run to your kitchen and make this, STAT!